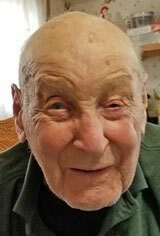 Howard Gordon Cole of Kentwood Park, Picton, and formerly of Rossmore, entered into rest peacefully, on Friday, April 12th, 2019, at the age of 92. Son of the late John and Florence Cole. Beloved husband of the late Doris Irene Cole (nee Wood), for 66 years. Cherished father of Richard Cole (Nicole) and the late Beverly Bates. Also lovingly remembered by his grandchildren; Julia Bates, Patricia Bates (Matt), Kristopher Bates (Ashley), Christine and Chelsea Cole, and great grandchildren Sierra, Maverick, Alana and Abby. Howard was predeceased by his brothers; Gerald, Laverne, Lawrence, Daniel, Archie and sisters Viola and Mamie. Howard will be missed by his sister-in-law Rose Cole and his many nieces and nephews. Cremation has already taken place. A Memorial Service will be held at Steele Funeral Home, Moira Street Chapel, 30 Moira Street West, Belleville (613-968-2273), on Saturday, April 27th, 2019, at 11:30 a.m., with visitation prior to service from 10:00 a.m. – 11:30 a.m. Inurnment to follow at Belleville Cemetery beside his beloved wife Doris. If desired, donations to the Belleville Dialysis Clinic (make cheques pable to UHKF) or Fixed Fur Life would be appreciated by the family.